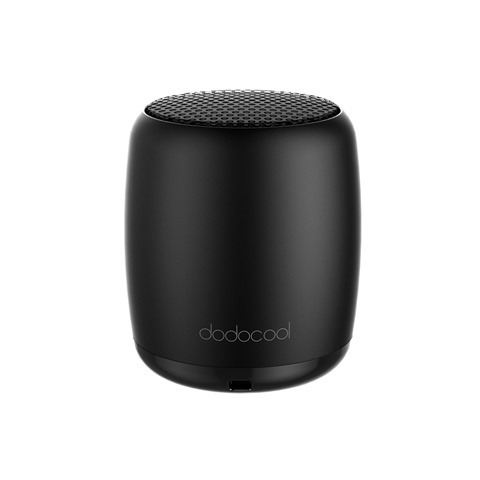 This is the dodocool Mini Wireless Bluetooth Speaker with Selfie Remote Control Built-in Mic Rechargeable 33-Feet Wireless Range Low Harmonic Distortion. 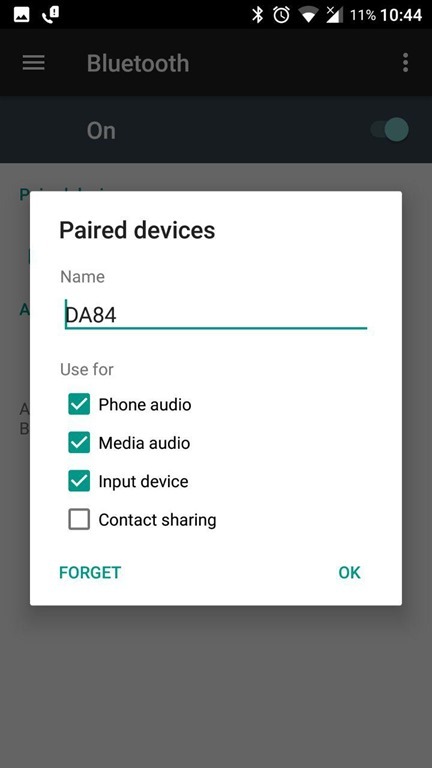 Its model number is DA84, and we have been using it for a few weeks now. 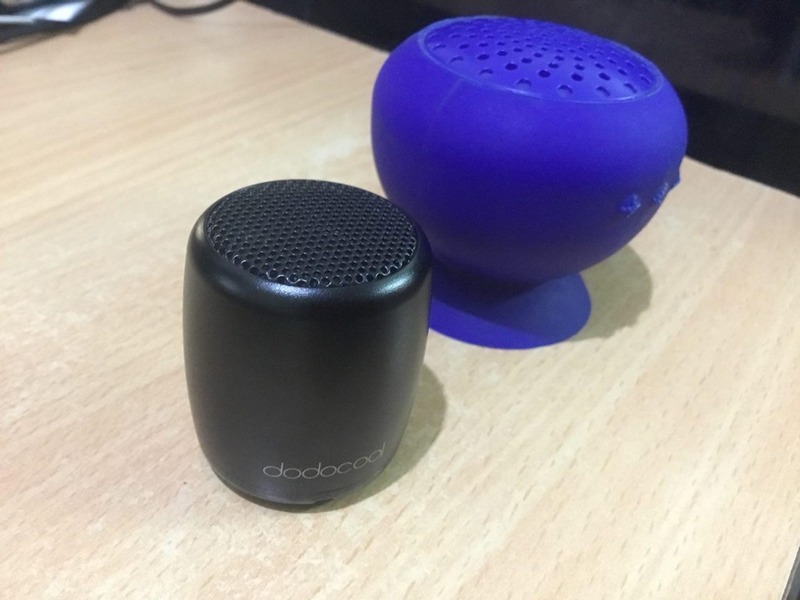 When I first opened the package, I was thinking, this dodocool speaker is about half the size of my current wireless speaker. How loud can it be? Turns out, it packs quite a punch. It's seriously insanely loud. 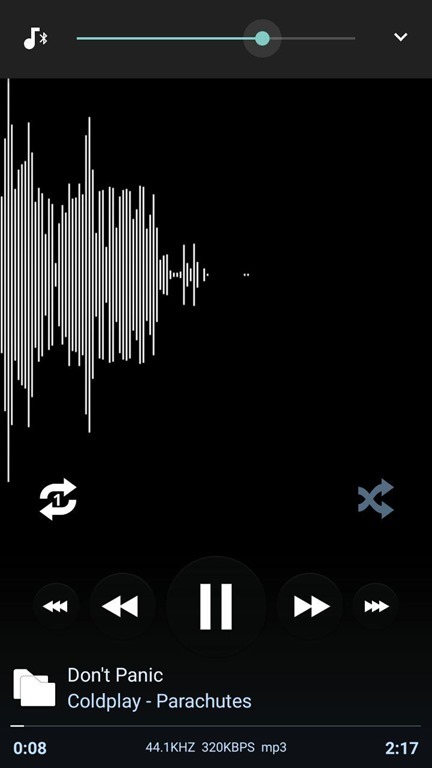 I had to reduce the volume on my phone to about 25% to play the music in a normal non-loud volume. 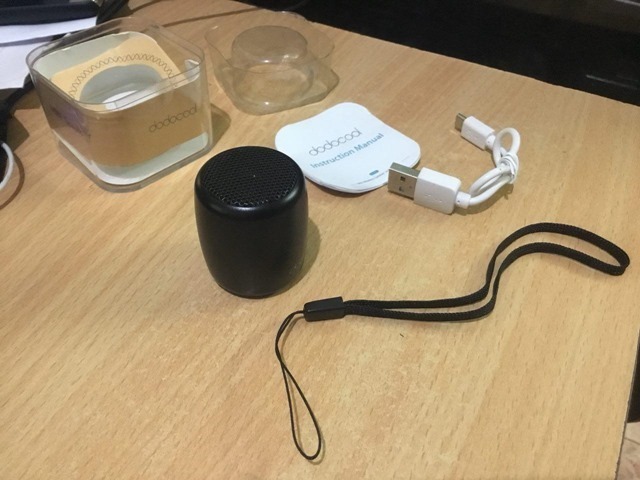 The speaker is small, very very small, and this makes it truly portable as it is easy to carry it around, and you also get a Free carrying cord, which you can plug to the speaker's notch. 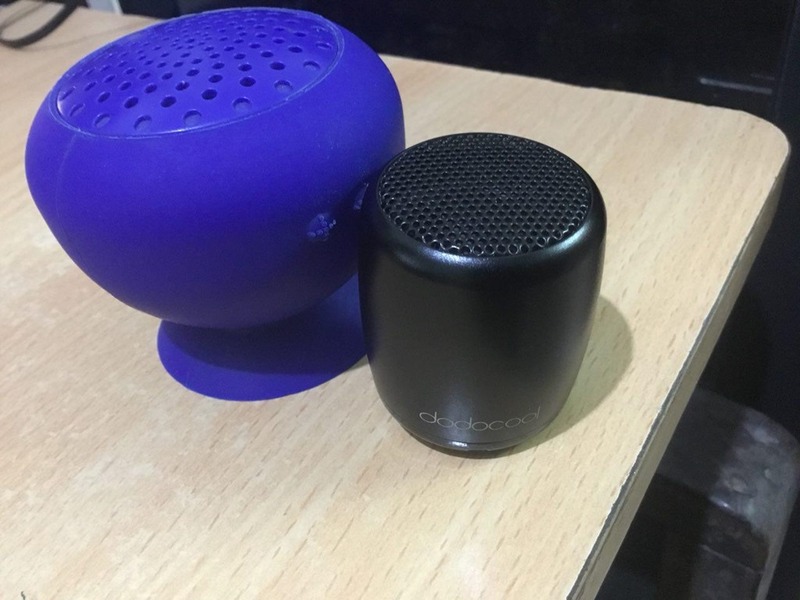 Despite its size, the speaker feels solid, as in it is slightly heavier than you'd expect it to be. It makes it feel premium, and so does the color. The black on the sides and on the grille are really glossy, and the color just blends in well. The USB port in particular, was placed near the bottom, and is almost not visible unless you are actually looking for it. The button on the speaker is clicky, which is a good thing. Press it for a few seconds to turn it on or off. The Speaker was instantly recognized on my Android phone, Laptop and iPad. 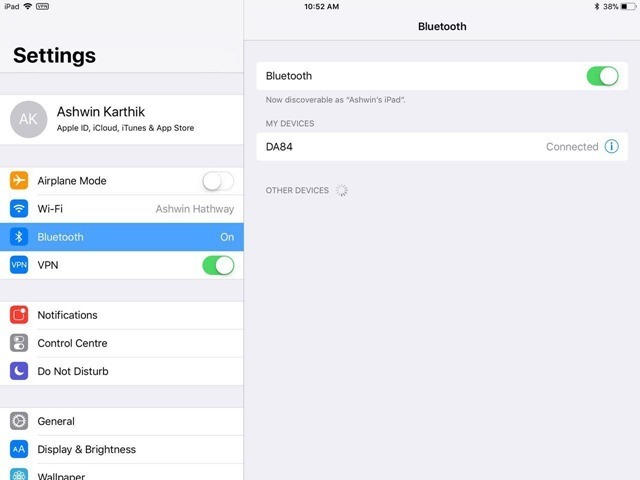 All I had to do was select the speaker from the device's Bluetooth settings, and fire up the music app or video app or a game. The music playback was excellent while watching videos, playing music, and when playing games. The sound was crystal clear thanks to the 3W driver. The sound does distort on extremely loud volumes, but this can be said of any speaker. But you should be fine using it on 50 or even 75% of your device's volume settings. The connectivity range is good if you are in a big room, and it plays the music just fine.However, when it comes to solid obstacles, like a wall, even if the speaker is only a few feet away from the source device (phone, tablet, etc), it has issues. That being said, I live in India, and my house is made of thick concrete walls and there is a long hallway. 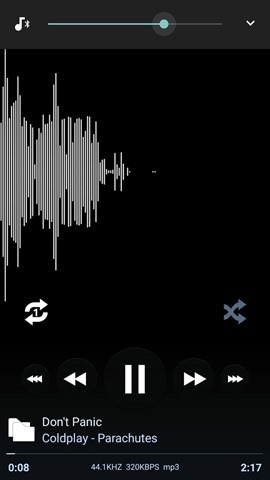 So, the sound broke often on the speaker, if I left the device in another room with a wall in between, even if it was only 5 or 10 feet away. But considering that US houses mostly have wooden walls, the speaker will work fine through such thin materials. To test this theory, I put the speaker inside the desk drawer (made of metal), while the phone sat on my desk, the top of which is made of wood. And the distortion was considerably lower, which proved that it wasn’t the distance, but the obstacles which are causing the distortion. If connectivity was the issue, the sound should have stopped, which it didn’t. 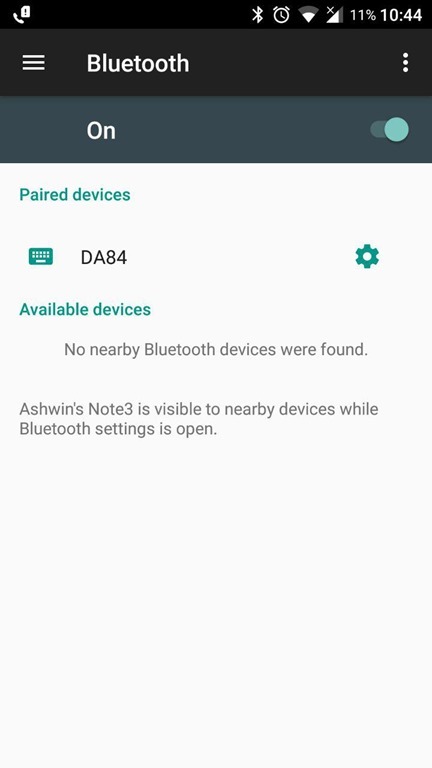 That's Bluetooth for you, you need an open area for it to work perfectly. Speaking of which, if I placed the speaker on my desk (it is in line with the door), and walk ten feet away from it, the sound continued to play without issues. But, for the best experience I would say, use it in the same room. It may be used on a car too, if you want to hang it with the string attached, or at the beach, etc. This was an odd feature, one which I actually found useful. I'm not a fan of selfies, but I have seen people struggle with selfie sticks, and a sudden movement could ruin the picture. That is not the case withe the dodocool Mini Bluetooth speaker, as the button on the speaker functions as a remote shutter button. And the best part was it worked just like that, I didn't have to set up the camera app on my phone or download any third party app. It works out of the box, which is really cool. This is a minor issue which I found with the speaker. You see, because of the selfie button, and probably because of the fact that it has a mic, the speaker is detected as a keyboard input device. 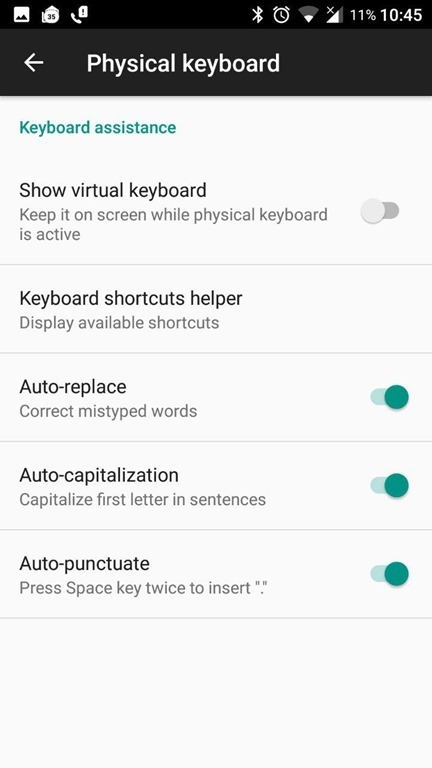 While that does sound trivial, the odd part is that apps recognise it like a physical Bluetooth keyboard, and do not show the virtual keyboard, so you can't type while using it. As a workaround for this, go to the device settings (on Android), and select the option to "show virtual keyboard - keep it on-screen while physical keyboard is active" and it completely negates the issue, so you can send texts, emails, IMs, without having to switch keyboards. On iOS, just tap the virtual keyboard icon in the text field. When you turn the speaker on, it plays a sound, and when you turn it off it plays a different sound. 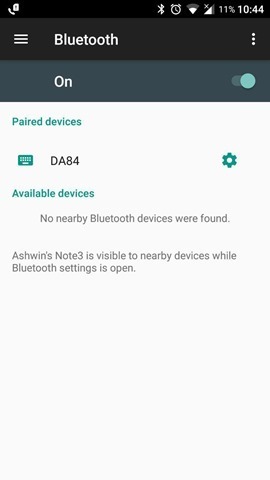 Similarly, it plays different tunes when the device is out of range, or when the battery is low. This was very impressive and helpful. There is a pin-hole sized LED indicator which glows in a blinking-blue light when the speaker is on, and a solid red light when it is charging. This helps you see if the speaker is charged or not. You can use the microphone in the speaker for recording audio, or to answer incoming calls. This works just like a Bluetooth or wired headset. The official rating says the speaker offers 4 hours of playback. But the battery life on this speaker is so good, that I think it is some sort of sorcery. Seriously, it was amazing, and I still don't get how a 300mAh Lithium Polymer battery can last this long, it just goes on for hours and hours. I actually let it play as long as it could till it would run out of juice, and it took much longer than 4 hours. The standby time on this speaker is equally amazing, it was on for days without use, and still worked fine. And of course, you can actually use the speaker while it is charging. The provided USB cable is really short though. If you have a 5V charger, you can use that. DO NOT use a fast charger, as those are usually 9V (2A), and they could possibly damage your speaker. 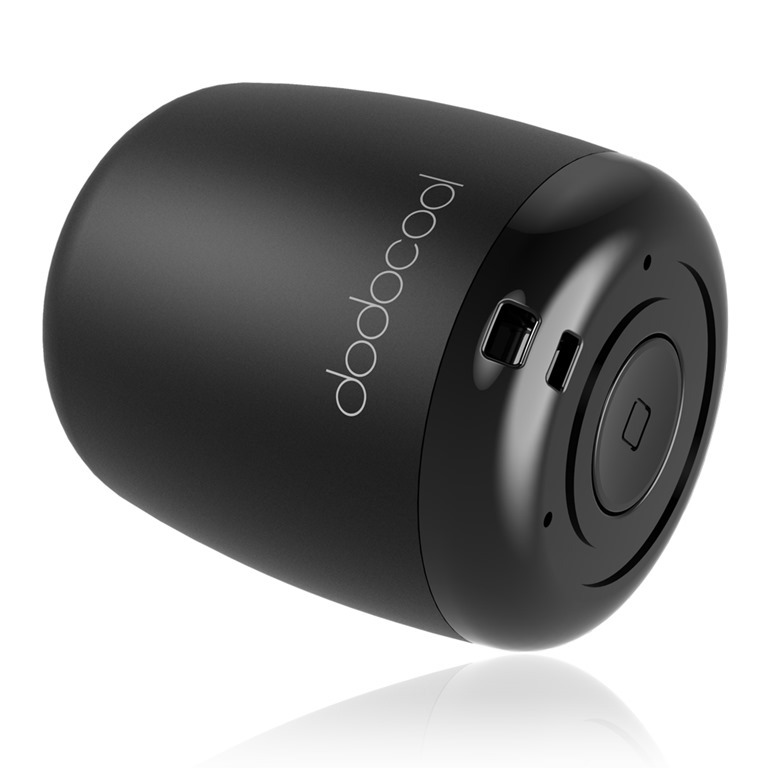 You get all of the dodocool Mini Wireless Bluetooth Speaker's greatness, for just $12.99 from Amazon.com. This is what I call bang for buck. Connectivity breaks if you have a solid obstacle between the devices. 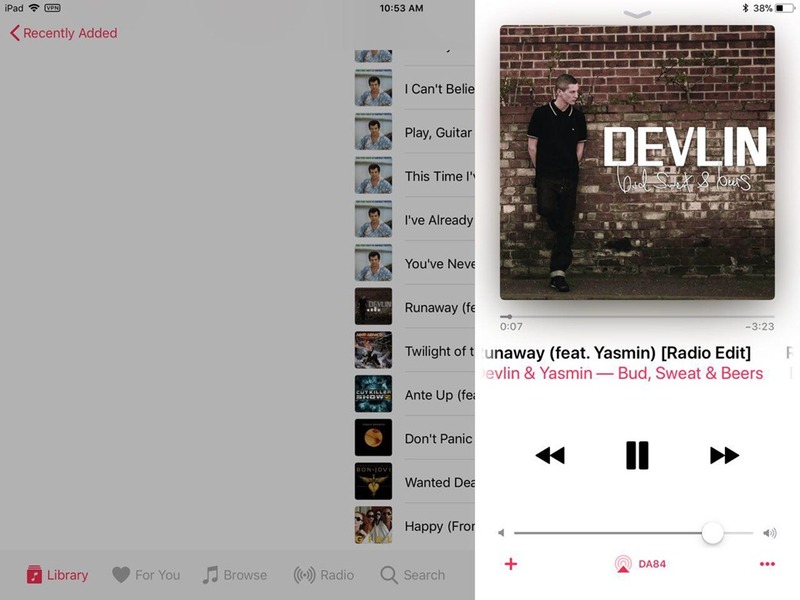 No volume/playback keys on the speaker. 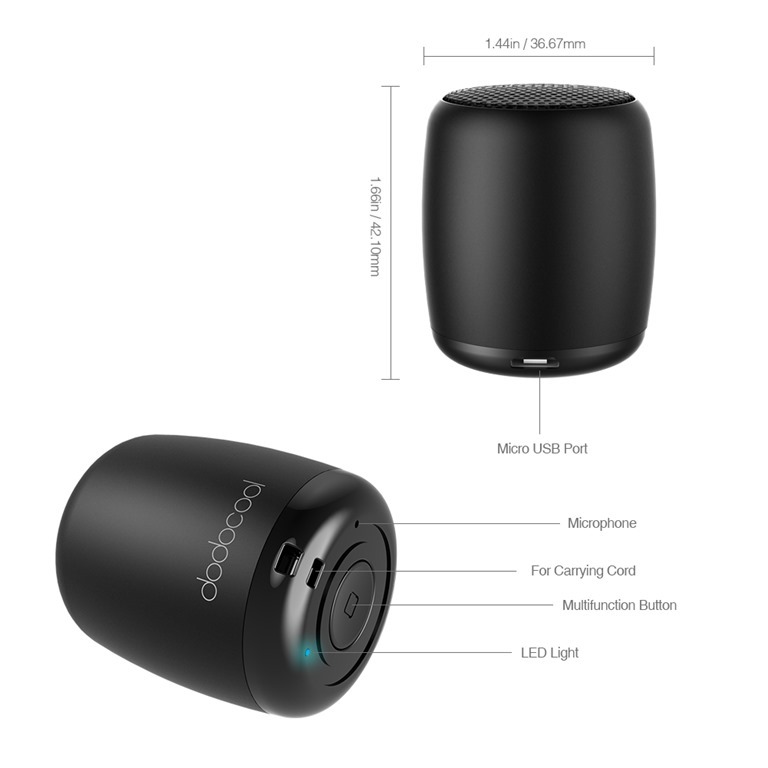 If you are looking for a good Lightning EarPhones for the iPhone X or iPhone 8 or 8Plus or your iPad, check out our dodocool Lightning Earphones review.